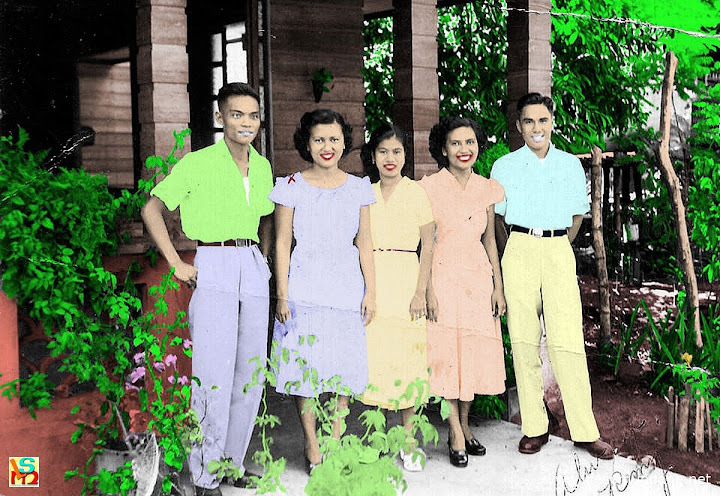 Colorized photo of my mother (2nd from left) and aunt (2nd from right) taken in front of our ancestral home in Nasugbu. While Lipa City, back in the mid- to late-sixties when I was a young boy, was still by and large agrarian in nature, there were still many mundane amenities that we enjoyed and took for granted that those elsewhere in the Province of Batangas simply did not have. This I knew because, ever so often, my family would make the three- to four-hour trip to visit my maternal relatives in the town of Nasugbu in western Batangas. I loved seeing my relatives and I loved Nasugbu itself; but getting there was always the unattractive part. The roads were always so bad particularly in the Pinagtungulan (a village in the outer fringes of Lipa) to Cuenca stretch where the asphalt pavements were quickly reduced to rocks and gravel by tropical downpours almost as soon as they were repaired. The bumpy ride was always agonizingly slow and monotonous. Nonetheless, arriving in Nasugbu invariably always brought me great joy, not least because I always looked forward to seeing my grandparents, uncles and aunts – by whom we were hopelessly pampered – and numerous cousins. We were the relations who moved away, while they all lived close to each other. It was always a great pleasure to reconnect. Blood, they do say, is thicker than water. My grandfather was a Vasquez, hardly surprising because many of Nasugbu’s older families have surnames starting with the letter “V,” likely because of the Spanish Governor Narciso Claveria’s 1849 decree. My grandmother, on the other hand, was a Simuangco, daughter of a Chinese from the mainland whom my mother used to recall wore a Manchu braid. They built their home at the town’s center conveniently located just a hundred meters from the plaza and the central school which my mother attended and where she also later used to teach; and virtually a stone’s throw from the parish church. They raised a large family as was typical of the day; and our rare visits were always excuses for impromptu get-togethers. This was why I loved going to Nasugbu for day visits. I loved it less when I had to stay for, say, an entire weekend. First of all, I was born a homebody; and I have always found it challenging even to this day to adjust to unfamiliar surroundings. More than this, however, life in Nasugbu was laid back and stark even by sixties standards, like being in an altogether different era. Our ancestral home was a two-story wooden structure built on a concrete foundation. It had capiz windows that one could slide open on sultry nights. Lipa born and used to upland climate that I was, this was scant comfort; albeit the night air was scented by the ylang-ylang from the cananga tree that grew next to the house. I was always assigned a room on the second floor the few occasions when I actually stayed in Nasugbu for a few days. My own mother was perhaps to blame about why I always tossed and turned till I finally fell asleep each night in the wee hours from sheer exhaustion. She used to tell us stories of how footsteps could be heard on the wooden floor or the sound of the sewing machine being operated even when there was nobody upstairs. Then there were the bats that made creepy squeaky sounds as they flew through the night to feed on fruits and insects. This was an era when children grew up to stories of fearsome nocturnal creatures such as the aswang and the ikî, so the sounds that the bats made terrified me. At the rear of the house was the kitchen, my certifiable favorite place of all because my grandmother was always cooking something. Everything was cooked over an antiquated concrete charcoal stove, which gave food this somewhat smoky flavor that I have always loved. Because there was always something cooking in the kitchen, a sack or two of charcoal was always nearby. A Vasquez clan picture taken after the wedding of one of my aunts. Because my grandfather used to be in the United States Navy, even after he retired he and my grandmother would periodically make the trip to Sangley Point in Cavite to do what they called the “commissary.” This was just shopping tax-free for American-made goodies at the American base still at Sangley Point at the time. Thus, one cabinet in the ancestral home was always filled with these goodies, and raiding it for Kisses or a bar of Babe Ruth was almost obligatory. Drinking water was fetched using a pail attached to a long rope from the well behind the house and dispensed from a large earthenware pot. My taste buds could never quite agree with the water in Nasugbu, which was somewhat salty because of the town’s proximity to the sea. I kept hydrated on soft drinks and juices. Bottled water was still years into the future. The bathroom was a small structure made of bamboo right next to the well in the middle of the backyard. The yard had no grass so was either dusty or muddy, depending on the weather. My grandparents raised turkeys, geese and chickens; and these freely roamed around the backyard. Mealtimes were ridiculous by our standards at home in Lipa. Breakfast was served at five in the morning; lunch at ten; and supper at four or five in the afternoon. In fairness, I was never obligated to observe these and ate whenever I wanted to. My grandmother was always tolerant. In retrospect, these mealtimes were probably indicative of the lifestyle she grew up to during an era when rising early was mandated by work to be done at the fields or out at sea. This was why, particularly when she was getting along in years, she retired to her bed sometimes even before six. She had to get up early the next morning to cook breakfast and go to market. A refrigerator was out of the question. Electricity in the town was only made available in the evenings and promptly turned off early the next day. The daily trip to the market was mundane; but I have fond memories of having ridden back to the house from there on a horse-drawn calesa (carriage) with my grandmother. Used as I was only to motorized transport, the calesas were quite the novelty. There was no television, either; but while on the downside I missed my favorite daytime cartoons, on the upside this also meant hours upon hours spent playing with cousins or listening spellbound to stories told by my grandparents, uncles and aunts. Whether I stayed for a weekend or just for the day, any trip to Nasugbu was always made special by family picnics at the dusty backyard. A long table would be laid out on the yard, rice served wrapped in long banana leaves and everyone ate with their bare hands. In the middle of the table would always be one or two tanigue (Spanish mackerel) tail grilled over charcoal, everyone’s certifiable favorite. Around the table were my grandparents, uncles, aunts, cousins and, of course, us. There was always plenty of food, plenty of stories and plenty of laughter. It has been half a century since those days. My grandparents, parents and many of my uncles and aunts have passed on. Nasugbu is no longer a sleepy town but a bustling first class municipality. But memories are still fresh inside my head; and these I share with anyone who cares to know. Memories of an era when life was stark and the simple things were the ones that mattered more.